The DPF60 is a combination microprocessor-based digital rate indicator and integrating totalizer. 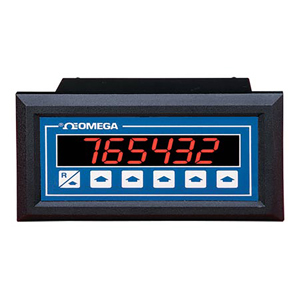 It accepts inputs of 4 to 20 mA, 0 to 20 mA, 0 to 5 V, or 1 to 5 V and can be scaled for engineering units directly from the NEMA 4X (IP66) rated front panel without tweaking internal potentiometers. The dual standard 5 A (@ 250 Vac) relays can be assigned to the ratemeter, or to the totalizer, or one relay to each for batch control and rate alarm. The display features a floating decimal point that moves left or right depending on how many "significant figures" the user has selected. In the totalizer mode, 6-digits can be displayed. The unit is fully scalable from 0 to 59,999, which indicates the flow rate represented at 20 mA. A peak and valley feature allows the user to call up the recent high and low readings. A square-root extracting input is optional on all units for use with differential pressure flowmeters, such as orifice plates and pitot tubes. With the DPF66, the user can toggle between rate of flow and total flow (6-digits) from the front panel. The rate display is selectable for units per second, minute, or hour, and the totalizer integrates in the same engineering units. The DPF65 displays just total flow, while the DPF64 only displays rate of flow. Ratemeter with 2 separate 5A SPDT alarms with square root extraction, 4 to 20 mA output. Note: Comes complete with operator's manual, mounting bracket, gasket, and 2 screws.